U.S. Supreme Court Associate Justice Clarence Thomas' autobiography goes on sale Monday morning October 1. Thomas, a staunch conservative, received a $1.5 million advance. Good for him. Yet, word is that Ol' Clarence, the second black to serve on the High Court, is a very bitter associate justice and, it appears from the early reviews, a very bitter man. Totenberg described My Grandfather's Son as "intensely personal - far more personal that any memoir I have ever read. And it’s language is so vivid that it’s almost uncomfortable at moments to read." "What gave these rich white men the right to question my commitment to racial justice? Was there no limit to their shamelessness?" Which senators was he talking about? Many, said Nina, among them Sen. Judiciary Committee Chairman at-the-time Joe Biden who he calls "a hypocrite." And Patrick Leahy of Vermont who dared questioned him on abortion rights and the law. "[Leahy's] bullying was something I just didn't give into," writes Justice Thomas. St. Patrick's been called a whole of of names, but I wasn't aware "bully" was on the list. "Well, it’s an interesting reaction he had. I simply asked a routine question about whether he ever discussed Roe v. Wade. "He surprised everybody, Republicans and Democrats on the committee by saying he had never discussed Roe v. Wade or the hearing, even though the decision came down while he was in law school. "I don’t know any senator who believed that answer, either Republicans or Democrats. Most people were kind of scratching their heads wondering why he wouldn’t tell the truth about something like that." SENATOR LEAHY: You were in law school at the time Roe v. Wade was decided. Was it discussed while you were there? THOMAS: The case that I remember being discussed most during law school was Griswold. But I did not spend a lot of time debating all the current cases. LEAHY: I am sure you are not suggesting that there wasn’t any discussion at any time of Roe v. Wade? THOMAS: Senator, I cannot remember personally engaging in those discussions. LEAHY: Have you ever had discussion of Roe v. Wade in the 17 years it has been there? THOMAS: Only in the most general sense that other individuals express concerns, and you listen and you try to be thoughtful. If you are asking me whether or not I have ever debated the contents of it, that answer to that is no, Senator. LEAHY: Have you ever stated whether you felt that it was properly decided or not? THOMAS: I don’t recollect commenting one way or the other. There were, again, debates about it in various places, but I generally did not participate. I just finished watching him on 60 Minutes tonight with Steve Croft. Pretty good interview. Reminded me of the time back in 1991 when I stayed up to all hours watching the hearings. I'm surprised that Clarence Thomas' memoirs would require a whole book. I thought he would simply issue a press release to agree with Antonin Scalia's memoirs. "St. Patrick's been called a whole of of names, but I wasn't aware "bully" was on the list." It's been mentioned in your own blog thread's several times! His testimony was a preview of what has since become the consistent Republican strategy of never providing the whole truth. Sure, he may not have "debated the contents of it," but you can bet your behind that he discussed it. The question was whether he had discussed it. What would have been so hard about a simple "yes"? Most likely, he was afraid of the follow-on question: "And what is your opinion?" Given how far out of touch his stance is relative to the majority of Americans, he knew he'd be out on his keester if he'd been honest, so he chose the path of least possible truth to keep his extreme opinions out of the limelight. It's an all-too familiar pattern with modern-day Republicans. How I wish for the pre-Nixon days, when there were Republicans with scruples. Another Ike, or Roosevelt, or Lincoln would be very welcome right about now. 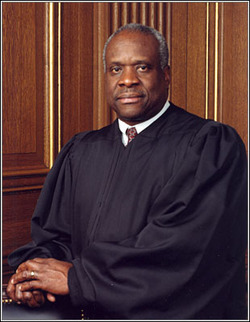 Raw Story is reporting that Clarence Thomas was a radical who sold his soul to work for the GOP. Looks like they talked about it last night on 60 Minutes. Check it out. Yep, Thomas was probably lying when he said he had no specific recollection of discussing Roe v. Wade. It's unfortunate that he felt he had to lie in response to that question. But as "slickwilly" points out above, everyone in politics lies, not just Clarence Thomas. I couldn't care less about Bill Clinton's Personal infidelities. It is nobodies G-D Business. Still don't quite understand why the busybody holier than thou types in this country can't get past that. You know, the same one who are oh so quick to cast the first stone before they are exposed as the Unconscionable hypocrites that they truely are, those deviants. What I have a problem with is having this legal lightweight being given a legend like thurgood Marshal's lifetime seat on the high court. That is offensive. Never discussed Roe V Wade, my aunt fani! "I couldn't care less about Bill Clinton's Personal infidelities"
And, I could care less whether or not Thomas discussed Roe v. Wade while he was a law student. Good for you. I'm not interested in your opinion on ANY matter, either. I am concerned that Bush one step over numerous vastly better qualified canidates to nominate this unquailified, devisive partisan hack. Um, he was confirmed by the senate......But wait just blame Bush it is so much easier. Clinton's marriage problems are irrelevant to whether or not he could carry out his official duties. Thomas' inability to tell the truth about critical issues that would come before him on the court is directly relevant to whether or not he could be expected to fairly adjudicate those cases. matallandy, Bringing up Willy's extramarital affairs only illustrates the point that it isn't republicans are liars, but that politicians on both sides of the line are. ANd, whether you care to acknowledge the fact or not, Clinton's lying under oath, a felony purjury, certainly does affect his ability to carry out his official duties. It would be ironic if the President of the United States wasn't even allowed to vote, or the Commander in Chief of the military was barred from owning a firearm. HAHA. Your assumption is that Thomas was lying. Was he indicted? Tried? Convicted? DO you realize in this country that you are innocent until proven guilty? I suppose Bush lied about WMD's as well. You people who complain about how this administration has trashed the constitution and then automatically convict people based on heresay and rumor are being extraordinarily hypocritcial. Just like the drug war is one big lie? Think the Progs thru Tony will go for legalization of marijuana? Watch out Douglas. Sandy, the progs aren't going to run on a marijuana legalization platform. ANd, even if they did Tony doesn't stand a chance even in this backwards state. Haven't seen you post in a while, turn your self in? I'm guessing its harvest season. But WTF are we doing on this blog. Its too damn nice out to be here. "Um, he was confirmed by the senate......But wait just blame Bush it is so much easier." You can see where the decider got his concensus building skills. From his daddy. Thomas was confirmed by the Senate with a 52-48 vote on October 15, 1991, the narrowest margin for approval in more than a century. Insteed of sending a qualified, easily confirmable canidate, He decided to send this clown. Thankfully, I think it might of had a part to play in Bush I's enevitable defeat. "Thomas was confirmed by the Senate with a 52-48 vote on October 15, 1991, the narrowest margin for approval in more than a century." Ah yes, but confirmed is the key word. It really doesn't matter if it was 100-0. He was confirmed, he didn't let Leahy the Bully (got that Freyne) brow beat him into setting himself up, and he has a life long appt. I don't know so I'll ask the question, how many times has Thomas voted alone in a decision? Oh, you are just so full of nonsense, JPC! When the shoe is on the other foot and the next preident send the most liberal partisan hack up to capitla hill, I don't want to hear word one from the regressive, reactionary right. Just stiffle, bite your lower lip and swallow, just like we had to when this joke of a jusist was forced through confirmation. "how many times has Thomas voted alone in a decision?" He's a legal lightweight on the most powerful court in the land! THe guy never asks questions during arguments! He's a legal lightweight on the most powerful court in the land! The only question he asks is when it is time to ask Saclia how he is supposed to vote. Hell, I can do that! So-Called "vermonter" is probably (barely) more qualified to sit on the bench than this Charlatan. The guy is a hack, plain and simple. You'd los you mind if a say, oh I don't know, Pat Leahy was nominated. Unlike this pretender, Leahy would actually be quailified. Oh, you are just so full of nonsense, JPC! And "nonsense is not the word I meant to use. When the shoe is on the other foot and the next preident sends the most liberal partisan hack who is barely confirmable up to capital hill, I don't want to hear word one from the regressive, reactionary right. Just stiffle, bite your lower lip and swallow, just like we had to when this joke of a jurist was forced through confirmation. By two arm twisted votes. THe guy never asks questions during arguments! The only question he asks is when it is time to ask Saclia how he is supposed to vote. Saclia probably just tells him how to vote. Hell, I can do that! So-Called "vermonter" is probably (barely) more qualified to sit on the bench than this Charlatan. The guy is a hack, plain and simple. You'd lose your mind if say, oh I don't know, Pat Leahy was nominated. 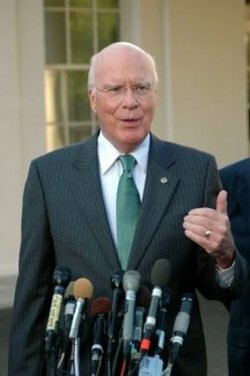 Unlike this pretender, Leahy would actually be quailified.